I’m sitting in the Narita Airport with a three-hour layover, so I might as well put my time to good use and do some writing. Our family is returning from a two-week trip in Taiwan to visit my in-laws and do a little sightseeing. 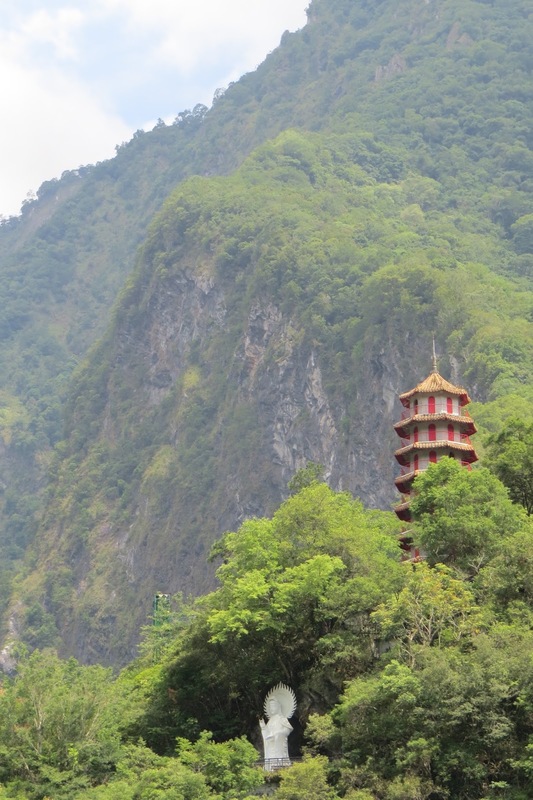 I could write many pages about this whole trip, but today I’ll just tell about an excursion we took to Taroko National Park on the east coast. 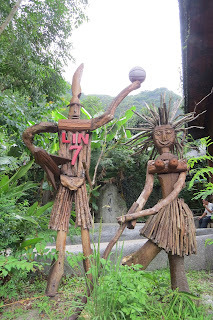 Many people consider this an obligatory trip when visiting Taiwan. But despite all the times our family has been to the island, this is the first time to Taroko. To get there, we took a three-hour train ride through beautiful, green scenery and many, many tunnels. I love train rides like this, especially the exotic scenery and small towns. We passed through the coastal city of Luodong, where I lived for several months a long time ago—one of my most favorite places I’ve ever lived. It’s a town built around a large park, with the park being the center of most activity. That tends to add a sense of casualness to life in the city. It’s like having a big front porch on your house. 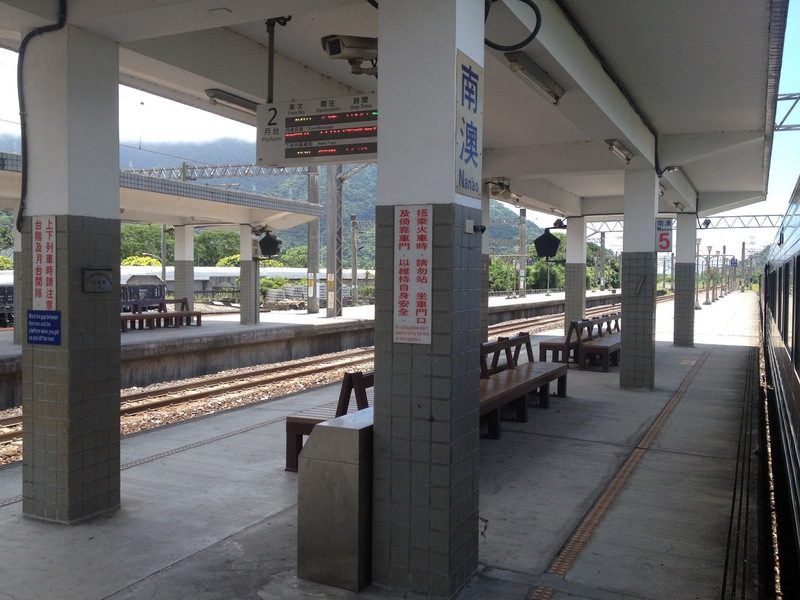 Taroko is accessed from the city of Hualien, a comfortable town right on the coast. Taiwan lies on the edge of the continental shelf of Asia and Hualien is on the edge of Taiwan. That means the deep ocean is very near by. That fact is very apparent when typhoons arrive. Big cruise ships and container haulers ply the waters just off the coast. Our first night in Hualien, we chose to eat in the Rainbow Night Market. That sounds kind of cool, and I suppose it is. But the sanitary conditions in a rural night market are, shall we say, far below typical Boy Scout camp levels. We sat at a lopsided table with a sticky coating from previous patrons, where a contingent of flies and mosquitos joined us. It would make my loving mother cringe, but it’s the type of experience we’ll always remember. 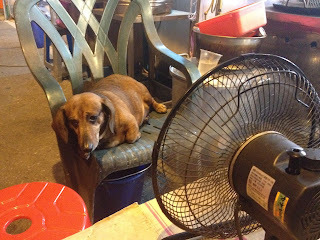 Plus, we sat near a very chunky dog who I’m convinced couldn’t move under his own power. He had his very own special chair and a dedicated fan blowing on him the whole time. It was cute, but reminded me of the humans in Wall-E. The next day we drove up the canyon to Taroko. It’s a beautiful area with an impressive limestone canyon that’s been hardened by tectonic movement into marble. (I know this, because Wikipedia told me.) The walls shoot up high above the road and drop precipitously down into the gorge just a few feet from the edge of the pavement. It’s definitely worth a visit! 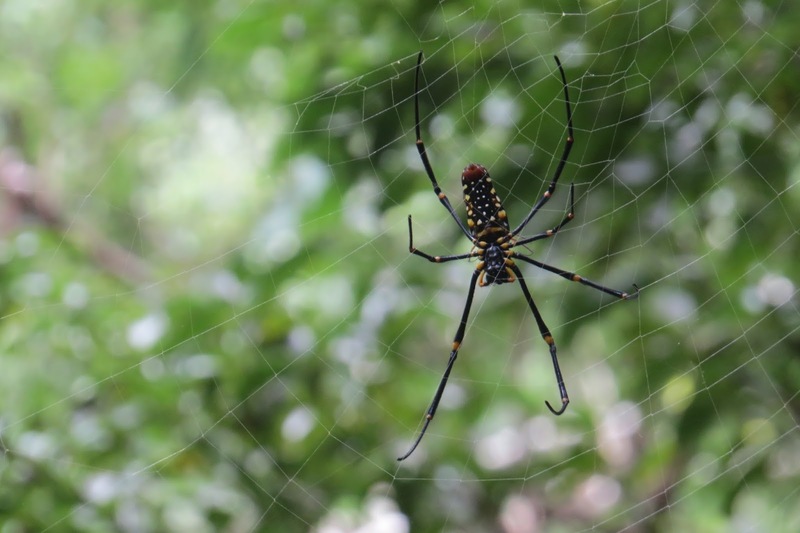 We took a several short hikes through the subtropical forest, where it’s always fun to see the insect and arachnid life, and sweat a few gallons in the humidity. 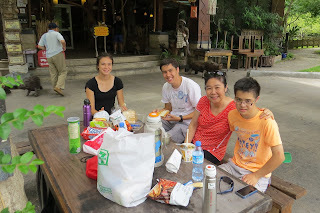 We ate lunch at another sticky table in a traditional aboriginal village. The unique, ancient culture—dating back thousands of years—was very apparent in our menu of Chips Ahoy and Pringles, and in the shrine dedicated to Jeremy Lin. 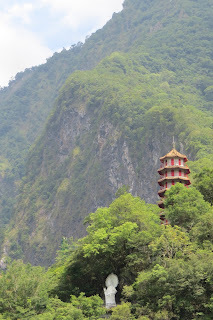 The Tian Xiang area at the top of the Taroko Gorge draws the most visitors. There’s a small village with shops and restaurants, and a very long flight of stairs leading to a seven-tier pagoda high above village, and another spiral staircase that leads to the top of that. It’s kind of like the temple in Kungfu Panda and the stairs that lead down to the Special Ingredient Noodles. Except there wasn’t a talking panda, unfortunately. Many people choose to take photos of the pagoda from a distance, especially when it’s so hot and humid. But our kids wouldn’t stand for that. Aarim and Roro led me up all those stairs to the top tier of the pagoda. It provided an impressive view of the surrounding area, but more importantly, a refreshing, strong wind. We had cell reception so we called my wife who waited down in the village with Tian Tian. He answered and we watched his orange shirt bobbing across the village like a tiny lady bug as he ran around looking for Stephanie. Once he found her, they looked up and saw us waving down from the pagoda high above them, like little praying mantises. After all that, we had another interesting adventure on the way down the canyon. But I’ll leave that for another posting.